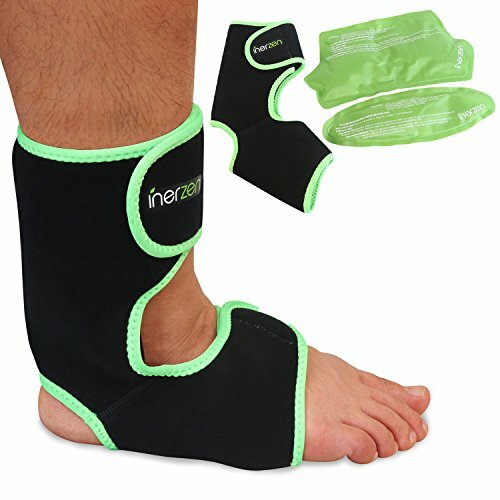 The Inerzen Foot and Ankle Gel Therapy Wrap is a durable and versatile device designed to provide pain relief where and when you need it most. Our Foot and Ankle Wrap can provide comfort from common ailments to your ankles and feet such as Achilles tendon injuries, Plantar Fasciitis, Bursitis, sports injuries, aches, muscle pain, swelling, and much more! Simply wrap around your foot and ankle, fasten the Velcro strap, and insert the heated or cooled gel pad between the wrap and your foot or ankle for instant comfort. The Inerzen Foot and Ankle Gel Therapy Wrap comes with 2 gel packs (1 foot and 1 ankle) to provide hot or cold therapy to suit your needs. For cold therapy, just place the pack in a refrigerator or freezer and put it in the wrap. The pad stays flexible when frozen to allow easier use. For heat therapy, simply heat the pad using hot water or place it in the microwave and in a few minutes you'll have exactly what you need to feel great again. Simply wrap around your foot and ankle and fasten the Velcro strap where it feels most comfortable for you. Then place the heated or cooled gel pad between the therapy wrap and your foot or ankle where you need it most. Our therapy wrap fits either the left or right foot. The gel pads used in out therapy wrap are reusable and made with a durable Nylon lining to keep from rupturing or leaking. The inside is filled with non-caustic, non-toxic, eco-friendly gel. Durable and Safe - Gel packs are made from strong Nylon lining and filled with non-toxic, non-caustic, eco-friendly Gel. The therapy wrap itself is made from durable and breathable neoprene material. One Size Fits All - Simply wrap around your foot and ankle and fasten the adjustable Velcro strap to your liking, then slide the hot or cold gel pad into the wrap for easy application. Backed by Inerzen - Product comes with a 1 year limited warranty. Simply contact Inerzen's fast and friendly support for details. If you have any questions about this product by Inerzen, contact us by completing and submitting the form below. If you are looking for a specif part number, please include it with your message. Salonpas LIDOCAINE (4 PACK Special) Pain Relieving Maximum Strength Gel Patch!